Although there are 215 days to Christmas, the purpose of today’s story is to flag up some very special bags of help which have been given to the Stirling Smith. 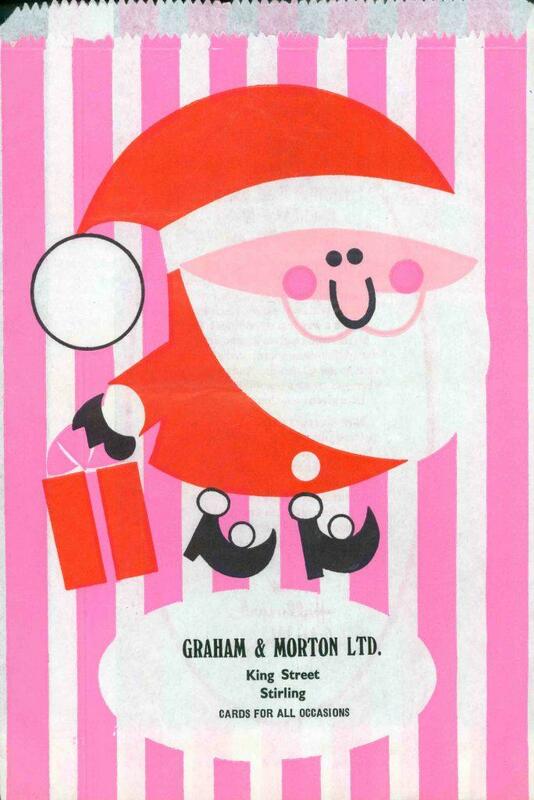 This little paper bag for cards was a very small part of the great Stirling enterprise of Graham and Morton. The company began in Stirling in 1830 in Baker Street, moved to King Street a few years later and was still there when the business closed in about 1988. It began in ironmongery and then expanded into furniture, house furnishings of all kinds, table and silver ware, tents and marquees, house removals and motor car sales. They operated a large cabinet and upholstery works on Burghmuir and had a warehouse in Falkirk, in an era when furniture manufacturing was local. The Smith has a collection of bags for many Stirling shops which are no longer with us: McLachlan & Brown, McAree Brothers and Jean Hamilton Ladies Fashion of Port Street. The Smith is not mounting an exhibition of bags but would like to express thanks for the recent Bags of Help from Tesco in Stirling and Bridge of Allan. This has enabled the painting of the glass roof in Gallery 3 to exclude the daylight which was damaging the collections.